Last Thursday night, sandwiched between our two-day trip to the Loire Valley and our five-day trip to England, we saw Lily Allen in concert at Le Zenith, the same 6000 seat indoor arena located in Parc de la Villette on the northeast side of Paris where we saw Fleetwood Mac the previous Saturday night. One could hardly have a larger contrast betweeen performances. Fleetwood Mac has been an intact band since 1975, when Lindsey Buckingham and Stevie Nicks joined the band 10 years before Lily Allen was even born. Who knows how many concerts they have performed in 35 years. Lily Allen, on the other hand, after being discovered on MySpace 4 years ago, has two albums out, and this was the first stop on a European Tour that would end up back in England where she is from. It was also the first concert she has done with a full stage set and backup band. I don't know what she did in South America last month where she did a few shows, nor what she has done in her previous shows in England.... I guess she just used recorded music. I became a fan of hers earlier this year after hearing the song The Fear on XM Radio. Having heard her in concert now, I must say there is something irresistable about this girl. She is naughty but naive, rebellious but not angry, childish but fearless, and vulgar but... well, just vulgar. Even her ridiculous song F*** You, directed at George Bush, is sung almost light-heartedly (unlike the defiant anger of, say, the Dixie Chick's "Not Ready to Make Nice"), which makes it all the more effective in a sense (although as political commentary it is a pretty air-brained song). Then again, maybe she's just a 24 year old train wreck waiting to happen, although I doubt she'll go the way of Amy Winehouse, at least I hope not. Whichever, she sure doesn't have much trouble getting her name and picture in the news. She certainly is not boring. For me, she is a welcome contrast to the "angry white chick" phase of the late 90s (personified best by Alanis Morrisette) and I find her music refreshing and fun to listen to. We got to the Zenith really early and were able to get on the floor about 7 rows back from the stage. After a wait, it was time for Lily. The black curtain rose to expose a stage set reminiscent of a cabaret show. The middle of the stage was lighted steps with the drummer on the upper left, keyboard on the upper right, bass lower left, and lead guitar lower right with a simple microphone middle front and three large video screens in the back. The show started with her rising up through the floor at the top of the steps. The music was a little too amped up at the start so it was hard to hear her but they seemed to get things balanced out after a few songs. Her outfit was jaw-dropping amazing... black and white striped one-piece leotard cut down to her navel with black hose and knee-high boots combined with a nice short bob hairstyle (which soon became a little messy... she kept playing with it), heavy mascara and a black widow spider painted to the side of her left eye. Are you kidding me? Ok, maybe "amazing" isn't everyone's opinion (see these comments about her appearance), but "jaw-dropping" describes my initial reaction perfectly. One British tabloid referred to her as a "mint humbug." 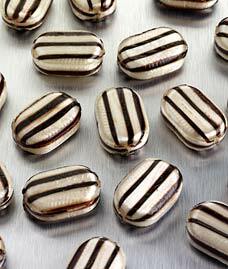 I didn't know what a mint humbug was so I looked it up and couldn't stop laughing. What do you think? She said right off that she had been nursing a sore throat and had been at the doctor all week (not a great way to kick off a tour) but, get this, she decided to smoke her way all through the concert. I also read later that the liquid in the cup attached to her microphone stand wasn't water but white wine! Now what kind of crazy performer nursing a sore throat at the beginning of a concert tour would smoke and drink during the show? The British tabloids had a field day with her flouting the "no-smoking-in-public-places" law that went into effect in Paris this year. (See here, here, and here.) At one point she lost her lighter and someone on the front row threw her his. He wanted it back and she said she couldn't throw it because it might, like, kill him or something and then she would be liable. Cute. So she left it on the front of the stage for him to get later. She giggled a lot between songs and expressed amazement at the big screens behind her, further evidence that this concert was a step up for her. Otherwise, she was pretty casual -- lighting her cigarettes, strolling the stage, dancing a little but not in a choreographed way... she was just having fun. I liked her being unpolished. She completed her set in about 1½ hours but came back (wearing a black and white print baby-doll top over boy shorts) with a couple songs including a darn good rendition of Britney Spears' "Womanizer." All in all, I could've listened to her all night... it ended way too early. I love her breathy voice. I can't wait till she comes to the States. More pics from the show at LilyPics.org. I took a lot of pics but they all came out terrible as did the videos. Another nice blog review here (where I got the two videos).